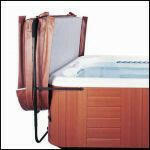 Stop breaking your back fighting with your hot tub cover every time you want to get in the spa. 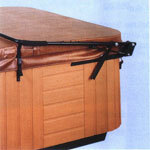 We have a large selection of hot tub cover lifters that will help make your life easier by getting the cover off of your hot tub quickly and easily. 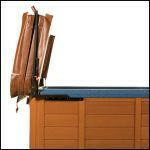 Use the handy chart below to compare cover lifters and find the right cover lifter for your spa. 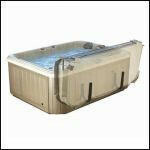 You've just spent $300-500 on a new hot tub cover, and you wonder why the last one only lasted you 3 years? 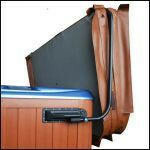 Here are some pro tips from our expert tub guy on how to take care of your hot tub cover to make sure that it lasts. If you're in the Southern states, a quality UVA/UVB vinyl protectant is mandatory, apply as directed 3-4 times a year. DO NOT use 'Armor-All' brand protectant as it contains petroleum distillates and damages vinyl long-term. A quality saddle soap or marine application protectant is good, or try our guaranteed 303 vinyl protectant spray. If you use bromine, keep the levels to a MINIMUM, as the gas trapped under the cover will "orange peel" the underside and make it brittle. When you shock weekly, it's very important to leave your cover open/off for a jet run cycle (15-20 min.) so expelled gases can escape. This protects the underside of your cover, as well as clears your water for clarity. To fix the plastic - get it dry and use good quality clear postal mailing tape to seal it back up. 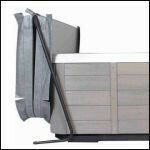 To repair cuts/holes in vinyl try our Permatex vinyl repair kit. This is a premium kit, and is most effective when cover is dry. Most cuts can be glued from the back side by adding a small scrap over cut and putting tape on front side, pulling it back into shape. A good vinyl glue can be found at NAPA auto parts stores, called 'VLP'. Lastly, you can remove your foam cores (they all zipper out at hinge) and flip them over and put them back in to reverse the 'sag'. This should be done once a year, or twice a year if your tub is 7' or bigger. This is a good time to inspect plastic bagging for holes or cuts and fix them.